Debra Adelson describes herself as an object maker. In school she “made more tableware than jewelry, even though I was in the jewelry program. I am a natural object maker, and tend to think of designs for objects that function.” The continued pressure from customers to make jewelry moved her from ‘flatware’ to ‘fun wear’. 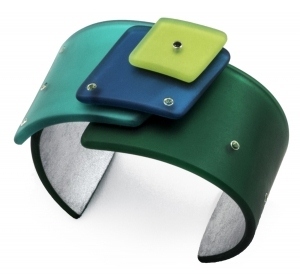 In addition to art shows and studio work, Debra found time to write a book for Lark…The Art Of Jewelry Plastic & Resin.